MACH Acoustics is a specialist acoustics consultancy providing acoustic design for all building types. We have developed into one of the leading acoustic consultants in the field of sustainable and creative acoustics. Our ethos is to constantly develop our understanding of acoustics and other disciplines, which is where this blog comes in. It covers areas of research that MACH is currently undertaking and examples of our forward thinking projects. This fascinating Women in Property September site visit to Bath Abbey explored the £19.3 million capital works, which are set to provide innovative and sustainable solutions to fulfil Bath Abbey’s critical requirements. MACHs' Catherine Adams was lucky enough to get a place on the tour, take it all in and learn a little more. 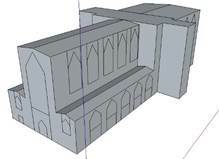 The project entitled “Footprint” includes stabilisation of the ground beneath the Abbey floor, which is currently in a state of collapse, tapping into Bath’s greatest natural resource to heat the Abbey using energy from the hot springs, installation of energy efficient lighting and storage, all inclusive of internal adaptation and downward excavation to provide a modern, welcoming space and facilities for the Abbey’s local community, choirs and school projects/activities and wider community of the City of Bath. Project Director Charles Curnock gave an overview of the project, followed by a guided tour of Bath Abbey and its Vaults, where the Norman and Roman excavations exist and where the majority of the works will take place. Over the summer months MACH Acoustics was privileged to be given access to the Abbey, carrying out acoustic assessments and research. With such a unique space to explore and understand; the MACH team, led by Josh Childs, were able to measure the reverberation time across the space, using this to create a 3D acoustic model as part of the assessment. 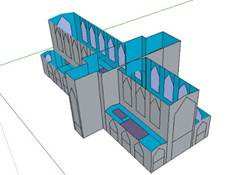 The findings of Josh’s report will be presented shortly to Charles and his colleagues and MACH hopes this may go some way in part to assist understanding the demands The Abbey has acoustically for the space to perform to optimum levels and what needs to be done for Footprint. MACH Acoustics: info@machacoustics.com. Powered by Blogger.